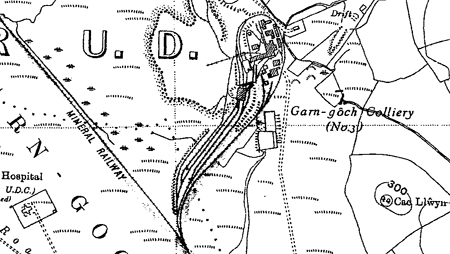 Garngoch No.3 Colliery Area Reproduced from (1936 -1947) Ordnance Survey map. No.3 Colliery with buildings and Drift to its right. 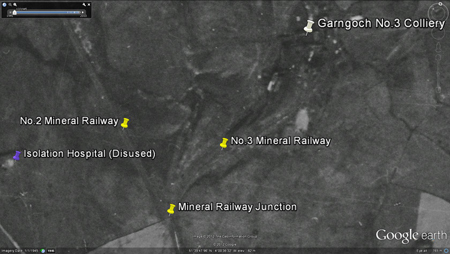 Mineral railway joining with No.2 from the left. In the bottom left corner is the disused Isolation Hospital. meaning red coming from the Battle of Gower 1136. The area is also linked with Roman times. The Battle of Gower 1136 memorial stone can be seen - follow sign post from Hospital Road, Garngoch. The No.3 was opened in this year. The No.3 was managed by S.R. Morgan and employed 152 / 43 men. The No.3 employed 468 men and was managed by D. Price. No.3 employed 308/57 the manager was D.J. Price. No.3 employed 353 men, manager D.J. Price. No.3 Pit employed 292/84 with Mr. Price still the manager. The No.3 Pit manager Mr.D.J. Price and employed 376 /76 men in the mine. No.3 was managed by D.H. Rees and employed 328/135 working the Five-Feet and Six-Feet seams. The No.3 Pit employed 311/115 men working the Five-Feet and Six-Feet seams and was managed by D.H. Rees. 490/127 men. Working the 5 foot and 6 foot seams producing manufacturing and steam coals, managed by A.C. Bevan. There were 328 men employed on the coalfaces at this colliery. The amount of men were 300 on the coalfaces in this year with the price list for the machine cut 31" thick 5 foot seam at two shillings and two pence per square yard. A total of 286 men were working at the coalfaces in this year. The No.2 Group along with Morlais, Mountain and Brynlliw collieries. The Group had a manpower of 1,987 men, and a total coal production of 435,477 tons. The manager was J. Griffiths, and the Area Manager was J.G.Tait. Many of the men were transfered to Brynlliw, 120 was just the start. In this month 238 joined workers at Brynlliw and others absorbed into other local collieries. No. 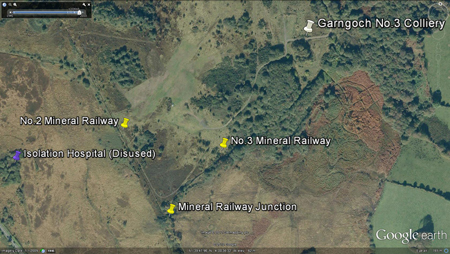 3 had a weekly output of 2,000 tons and its closure left only 13 pits within the Swansea No. 1 Area of the N.C.B. 's South Western Division at that time. The No.3 officaily closed by N.C.B to concentrate on more economic pits. It mainly worked the Swansea Four-Feet, Five-Feet and Six-Feet seams. "No. 3 Pit was closed down in view of the fact that the coal it now worked could be brought up more conveniently from the Brynlliw Pit, in February, 1966." "Garngoch" was used to filter the Cambrian index as best as possible with the information available.